At Nexight Group, we develop communication materials for our clients that make their target audiences take notice. Web content is no different. Search engine optimization, often referred to as SEO, is the process of increasing your website’s visibility in user internet searches. Search engines crawl and index site content, so what you say and how you say it is critical to ensure that your content is pulled into search results when it’s most relevant to the user searching for answers. While some companies specialize in SEO and tracking search engines’ complicated algorithms, there are a few simple best practices that you can implement without a lot of time or money. Write clear, descriptive page titles — The page title is typically pulled into search results as the largest, most prominent text. It’s a distinguishing factor in whether a user will determine if your page is relevant to their search. Each page title should be unique and should accurately describe the content on the specific webpage, where possible, using keywords that are likely to be searched. It’s also important to keep page titles short because many search engines, including Google, will only show a portion of the title in search results. Provide a meaningful metadata description — In search results, the description is typically pulled just below the page title (sometimes Google pulls other relevant text from your page as you can see in my Google search image above). It’s also what gets pulled when sharing your page on social media platforms, such as Facebook, LinkedIn, and Twitter. The description, which is usually 1–3 sentences long, tells search engines and users more about the page than the page title. Similar to the title, the description should accurately describe the content on the page and help a user assess the relevancy of the page’s content to their search. Develop simple URLs — Most content management systems allow you to customize your URLs within your website domain (e.g., www.nexightgroup.com), which makes it easier to share page links (e.g., the URL for this post is www.nexightgroup.com/search-engine-optimization-best-practices rather than a more complicated and less descriptive URL like www.nexightgroup.com/page132). Search engines crawl URLs as well as page titles and descriptions, and URLS are also displayed in search results. Therefore, it’s important that your site’s URLs are relevant, short, and descriptive because they provide one more opportunity to help demonstrate that your page matches a user’s search. For the same reason, it’s also important to clearly name the files of any images or documents on your website. Set up a logical website structure — Just as website structure and navigation is key to help users find content on your website, it also helps search engines better understand your site. A clear hierarchy (e.g., Home, News & Insights, this blog post) helps search engines better index your content, ensuring that the most relevant level of site content is pulled in response to a user query. 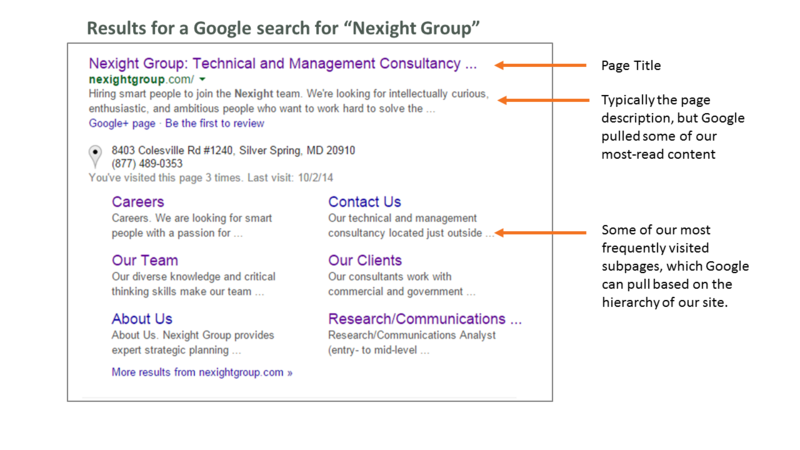 Breadcrumbs (e.g., Nexight Group >> News & Insights >> Search Engine Optimization: Four Best Practices for Getting Your Web Content Noticed) also help users navigate through your site by providing a map to the current page and a path back to the previous page. Though close attention to SEO can help drive visitors to your website, it’s important not to lose sight of the need for clear, concise, and meaningful website content. Your primary audience is never search engines. Your website content must be compelling and useful to your site visitors—the audience with whom your content must ultimately resonate.